With an atmosphere of polished elegance, fine architecture, and custom designed Italian furnishings, The Carnegie Hotel is everything a retreat in the Theater District should be: a quiet oasis in the midst of endless activity, and the perfect place for planning a trip to all the classic landmarks of the area. Modern, cozy, and inviting: the Theater District accommodations at The Carnegie Hotel add sophistication to a great night's sleep. With lively decor inspired by the musical heritage of Carnegie Hall, in each room guests will be pleased to find an array of deluxe amenities, as well as an intimate respite from a busy day in the city. Save 10% on your Non-Refundable stay. Stay Longer and Save 15-20% when you stay 3 nights or more! Perfect Location with Added Bonus! Perfect location, clean rooms and great amenities! Love this hotel! This hotel has been the best place we have ever stayed in during our visits to New York. It is immaculately clean. Our room had ample space for 4 pieces of luggage which easily slid under the bed. No noise from the busy street below. We stayed here for 4 nights in August 2018. 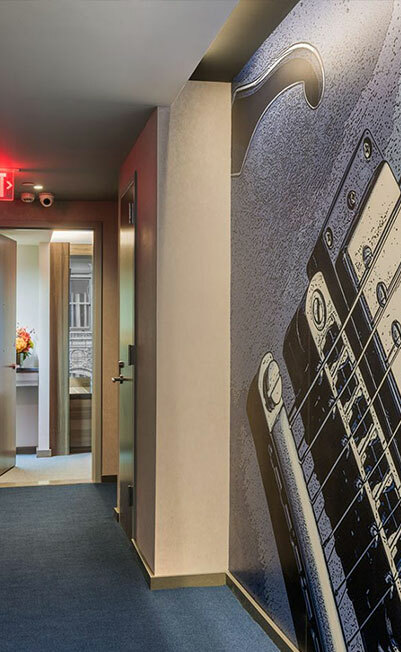 Situated a few blocks from Times Square in one direction and two blocks from Central Park in the other, the location is perfect for exploring mid-town Manhattan on foot and 20 minutes in a cab from the downtown area. © The Carnegie Hotel 2019. All Rights Reserved.